World of Warcraft's Mists of Pandaria expansion is huge. One one end, it starts at level one, with a new starting area for the new Pandaren race. On the other end, it raises the level cap from 85 to 90 and adds an enormous amount of high-end and end-game zones. Mists of Pandaria, then, is best looked at from two different perspectives. One: how is it for the new player? Since the game introduces a new character race and starting area, that implies it offers a good chance for players new to the game to jump in. And two: how is it for the experienced player? If someone's been in a holding pattern at level 85 for years, what does Mists of Pandaria offer to that player, and how do its many changes improve or diminish the World of Warcraft experience? To get both perspectives, we did something we've never really done before, and tag-teamed the review. I created a brand-new World of Warcraft account and rolled my first ever level one Pandaren to experience the world. Mike Fahey logged back in to his long-dormant level 85 character and set out to explore the higher levels of Pandaria. Both of us have been logging our experiences with the game. Here's what we think. As you approach, there's music and laughter pouring from every door and window, down the lawn and into the street. Clearly, the folks inside are having a good time. WHY: It offers a continuation of the World of Warcraft experience, but at this point that experience just isn't quite enough. [Mike] Earned a couple of new levels for my level 85 Alliance mage, collected pets, farmed turnips. Logged into my nephew's level 90 character to explore the rest of the new zones. Transferred gold from my nephew's account to mine without him knowing it. That'll show him. The lands of Pandaria are beautifully crafted considering the limitations of the aging game engine. There's not enough to distract from the tired gameplay of the previous 85 levels. The house is huge. There must be twenty rooms, plus a sprawling backyard. Everywhere you turn, there are enormous crowds of people. You haven't been able to find the bathroom yet, but you did manage to get to the kitchen and the bar well enough. Drink in hand, you're shouldering your way from room to room through the mob. You thought for sure there were going to be some people you know here, but then you find out you missed them by a couple of hours—now, they're somewhere else, and not coming back. As you listen to the conversations around you, you begin to realize everyone else here works for the same massive company. They're all talking about stuff from work that you just plain don't get. They all showed up fresh from the office in $1000 suits and designer shoes, and you're wearing a year-old pair of jeans from Old Navy. It's not a bad party. The drinks are good, the hosts are hospitable, and there's a crazy amount of food. Everyone else is having a blast. But having arrived so late, you just don't fit into the established conversations. You drift on the edge, overhearing some inside jokes you don't get. It seemed like it should be fun, but this just isn't your night. This party got started without you, and you're not really adding anything to it—or getting anything out of it. After another circuit of the house, when your drink is gone, you put the cup down and quietly leave the revelers to it. I cannot think of any better analogy for me and a month of World of Warcraft. World of Warcraft is not, by any stretch of the imagination, a bad game. It does many things very well. Most of those things, though, feel oriented toward getting players quickly and efficiently to the maximum level, where those players can then enter the raid progression. After eight years, it's not unexpected that WoW would be focused on its loyal players, the roughly ten million or so subscribers who occupy those upper levels. As a result, though, it doesn't feel particularly welcoming to new players—and that starts from the moment of purchase. Mists of Pandaria doesn't include the base game or any other expansion content. A new player must first buy the Battle Chest, and then purchase a Pandaria key. The early-level Pandaren content also doesn't necessarily add very much to the new player experience. Although the Wandering Isle itself is lovely, it introduces WoW's many small annoyances early on. Every task needs repeating slightly too many times—why 10 or 12 dead whatevers, when 6 would teach me a skill just as well? Why does the [x] I need to collect from monster type [y] only drop an average of one in three kills? And given that, why do I need a dozen of them? Still, the plot arc that wanders through the Wandering Isle does a good job setting up the point and purpose of Pandaria in the larger scheme of things, and introduces both the Horde and Alliance as worthy partners a young Pandaren might join. But once the Horde and Alliance show up, that's the end of it. Right around level 12, the player departs the Wandering Isle, never to return, and heads straight into "old world" content. Cataclsym is all right, but it's not Pandaria. To understand why a cataclysm is so important, and to know what effects it has on the before and after of Azeroth demand a context that a new player simply doesn't have. And instead of running around exploring the diversion of an Asian-themed world, full of soaring temples and irritating monkeys, it's right back to the same-old same-old of humans, dwarves, and elves. To a genuinely new player who's been busy exploring other MMORPG offerings over the last few years, WoW's age really shows. The art has a clear style, but it feels very undefined around the edges, and lacks the crispness of a 2012 offering. Getting around feels clumsy and slow, and the Pandaren experience involves a lot of back-tracking for a player who wants to level up a profession like skinning or mining. As well, the game's well-known penchant for pop humor can be extraordinarily distracting at times. Sure, I get that Mikael Bay is going to make something go boom (which is in character for a gnome), but... where do the thugs of the medievalesque human village I'm in get their sunglasses from? In the end, I just end up going through the motions, unsure of why. I do a quest because it's here; I collect loot from corpses because I really need coin in order to train basic skills. I'm moving through the world because it tells me to, and not because I want to see anything. Sure, the world has some highlights, but that's just not enough motivation to play through the 73 levels that interrupt the story that Mists of Pandaria began to tell on the Wandering Isle. Seven years. For nearly seven years I've played in Blizzard's colorful cartoon fantasy world. It began as obsession, every waking moment of those first few months not dedicated to sleeping, eating or earning a paycheck was spent exploring every aspect of that strange new place. As the months turned to years my relationship with World of Warcraft settled, as relationships often do, into a comfortable pattern. I'd dabble in high-end content, eventually wandering off to give other massively multiplayer games a chance to win me over. They never did. Blizzard drew me back again and again with the release of game-changing expansion. The Burning Crusade tempted me with the promise of new alien landscapes to explore. Wrath of the Lich King introduced an intriguing new character class and a battle with one of the setting's most tragic villains. The daring Cataclysm violently reformatted the entire world of Azeroth, giving me a compelling reason to explore the planet all over again. I awaited the release of each new expansion with giddy anticipation. It was no different with Mists of Pandaria. I logged myself out in the Alliance capitol of Stormwind so I'd be ready to plunge headlong into the newly discovered panda lands the moment the pack went live. 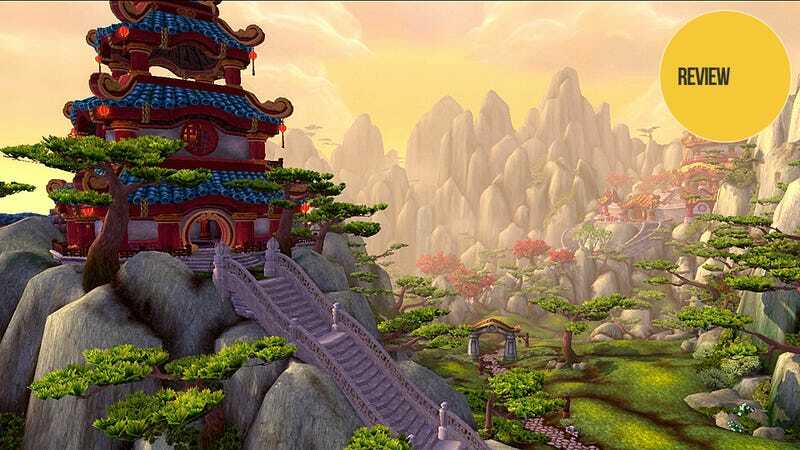 I spent the first few hours in game cooing over new features and soaking in the Asian flavor of Pandaria, all the while familiarizing myself with the substantial changes to game mechanics that had been instituted since I'd last seriously played. And then I got bored. So very bored. Within minutes of a rather spectacular entrance into the newly-discovered expansion lands I was back in the old World of Warcraft questing pattern. I killed a certain number of things. I collected a specific number of objects. While these menial task-lines often culminate in some spectacular setpieces, those brilliant moments end too quickly, and it's back to the quest grind. I am a machine collecting experience points and equipment in order to make it easier to earn more experience points and equipment. Certainly that's the same formula World of Warcraft has always employed. The problem is Blizzard is running out of ways to distract me from it. Within minutes of a rather spectacular entrance into the newly-discovered expansion lands I was back in the old World of Warcraft questing pattern. A portion of the blame lies in the previous expansion, Cataclysm. The major restructuring of the world was such a profound and powerful change that adding a handful of new areas to explore—no matter how well-crafted and packed with lore—pales in comparison. The gradual dumbing-down of the game's mechanics also play a strong role in the open-sore exposure of the tired gameplay. Back when there were expansive skill trees and equipment types to hem and haw over I could busy myself planning out my character or hunting down pieces of armor and weapons. Now I have nine sets of three talents each to choose from, and every quest line is designed to ensure my character is sufficiently outfitted for the coming challenges. There are new distractions here. I've harped on the expansion's Pokemon-style pet battles, and I've enjoyed the cooking-supplement farming mini-game more than I probably should. However, with full-game versions of both experiences readily available, there's no reason for me to spend $15 a month to fool around with them here. Mind you I'm coming at this from the mindset of a strictly player-versus-enviroment World of Warcraft veteran. I am not a raider. I am not a PVP-er. I just enjoy getting together in a group with some friends or strangers and running through quest content. Or at least I did. It's funny that Kate mentions that Mists of Pandaria is focused on World of Warcraft's most loyal players. I count myself among them, yet I'm not feeling the love.